discovered. From Pirates baseball in the summer, to Steelers football in the fall, to Penguins hockey from the fall thru spring, it’s a sports fan’s dream. For those with heavy appetites, legendary Primanti Bros serves up its iconic sandwiches and mouth-watering gourmet wings. There’s one attraction which gets local attention, but not the plentiful attention that it truly deserves. The Bicycle Heaven Museum is an attraction not to be missed out by any Pittsburgh visitor. No matter what occasion of the visit, its contents is a feast for the eyes. Bicycle Heaven Museum is nowhere short of ‘spoke-tacular’. Located at the corner of Preble and Columbus Avenues on Pittsburgh’s Ohio River side, Bicycle Heaven is a showcase of bicycle magic for all ages. 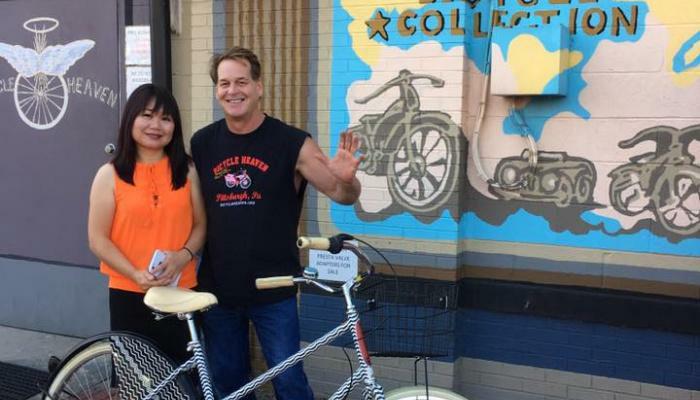 Bicycle Heaven was first established in 2011 by Craig and Mindy Morrow. Bicycle Heaven is no ordinary museum. It is truly mind-blowing. For avid bicyclists, bicycle enthusiasts, and bicycling historians alike, it is a place to be lost in awesome wonder. Bicycle Heaven is home to the world’s largest collection of bicycles from vintage to present day. Further, it is home to the world’s largest bike shop. Under one roof, Bicycle Heaven is home to more than four thousand bicycles. Plus, the museum is home to tons of rare artifacts, both bicycle and non-bicycle related. Craig Morrow has been the head of Bicycle Heaven since its establishment. After walking through the museum for more than an hour, it is incredible to comprehend how one building could hold such a never-ending arsenal of bicycles of multiple styles. From children’s bicycles, to adult bicycles, to bicycles used in movies and TV shows, Bicycle Heaven is nowhere shy of a Smithsonian museum in Washington, DC. It’s like walking into a time capsule filled with childhood and young adult memories. Any visitor would walk through its door and be blind-sided by the wall-to-wall bicycles and the mountains of artifacts and trinkets hanging about. Mr. Morrow was asked to elaborate on this incredible establishment he’s put together in just a short time. He was asked on how he managed to put together such a splendid collection. “I have been collecting bicycles for more than thirty years. It got to a point where I had bicycles of all types in all corners of my home.”. Mr. Morrow was asked if he gets bicycle donations to add to the massive selection of exhibits at the museum. He replied, “Oh, we do! We keep adding new bicycles every week. They come from recent visitors and bicycle collectors alike.”. The staff at Bicycle Heaven is one of the friendliest in all of Pittsburgh. No matter what visitors are in search of, the staff is more than happy to show them around and point out interesting artifacts. There are artifacts at Bicycle Heaven which no one would think would they’d stumble across. For instance, finding a framed Pennsylvania Railroad poster, Pee-Wee Herman’s bicycle from “Pee-Wee Herman’s Big Adventure”, and the multi-seated bicycle from The Monkees’ 1960s TV show. Yes, Bicycle Heaven has it! For model railroad fanatics, Mr. Morrow has an suspended LGB train setup spanning the entire second floor. Any visitor would feel like he/she is walking through a glorified Toys ‘R’ Us. It is a museum containing the memories of the past and present, all under one roof. Bicycle Heaven receives dozens upon dozens of bicycle donations and trade-ins. A member of Mr. Morrow’s museum staff, Zach Woodard, was asked how donations are handled, and whether donors are interviewed in regards to the objects’ authenticity. Further, Mr. Woodard was asked how they keep control of the many styles of bicycles that come through their door. Further, he was asked if donors are subjected to a rigorous screening process. “When anyone wishes to donate any bicycles, we do have a lengthy and detailed conversation with them via telephone. From there we determine whether or not we will accept their donation. If it’s an authentic item, they are asked to send pictures of the bicycle or artifact. From there, we determine if it’s a ‘yes’ or a ‘no’. If ‘yes’, we will pay for shipping. Unlike many museums throughout Pittsburgh and around the country, Bicycle Heaven is not government funded. Donations of any amount are accepted at the door. “They help keep our lights on!”, a sign says in front of the museum. Admission is free. The weekend of June 8th and 9th, and the weekend of August 24th and 25th, Bicycle Heaven will be hosting a trade show at RJ Casey Industrial Park. Bike groups are invited. New bicycles and bicycle dealers will be set up for display. Notably, antique/classic bicycle parts will be on display. Further details can be found at BicycleHeaven.org. When any visitor walks the streets of a fine city such as Pittsburgh, one can greatly appreciate the history, the culture, and the great vision that gives it the claim to fame it truly deserves. Bicycle Heaven is arguably among the top reasons why Pittsburgh is steeped in such history and unmatched vision. Pittsburgh celebrates everything from the past to the present. Bicycle Heaven is an establishment that does more than celebrate the past and present. It also appreciates the past, the present, and the future of bicycling, too. Undoubtedly, Bicycle Heaven is no run of the mill museum. Candidly, it’s the ‘wheel’ deal.